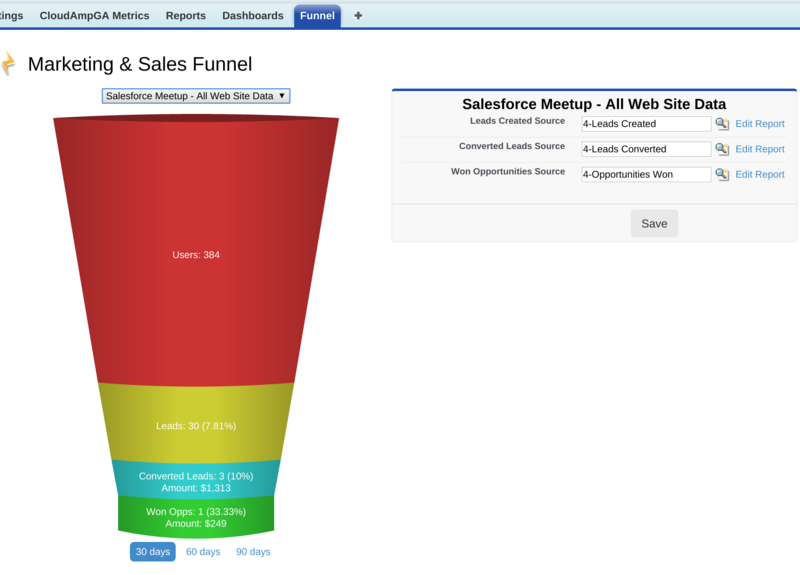 This Salesforce tab shows you your Users (web site visitors) from Google Analytics with your Leads, Converted Leads, and Won Opportunities in a large funnel chart. Plus it is easily customizable to view different time periods or change the source reports. The CloudAmp Analytics Dashboards Marketing & Sales Funnel is driven by standard Salesforce reports, so you can easily change or modify lead and opportunity data in your funnel. For example, since Users is the Google Analytics metrics of unique users (visitors) on your web site, you may wish to add filters to your Lead report to exclude non-web channels (such as tradeshow lead lists). You can change source reports entirely by clicking the magnifying glass, clearing the search box, selecting a new report and clicking Save. Alternately, click the Edit Report link and modify the source report provided by CloudAmp. (If you are new to Salesforce reporting, we suggest "Save As" and change to the new report using the magnifying glass, to save the original reports in case you need to restore them. For customizations or questions, please contact us.